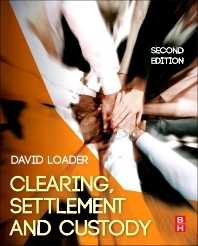 Four new chapters and updates throughout help this 2e of Clearing, Settlement and Custody summarize worldwide changes in the process of concluding a financial transaction. Noted consultant David Loader provides a highly detailed analysis of the central clearing counterparty concept, the drivers behind it, and its effects on operations teams. He also clearly illustrates the life cycle of a series of transactions to broaden the comparison process. Emphasizing changes in the regulatory environment stemming from the 2008 market crash and liquidity crisis, this edition uses new case studies and end-of-chapter quizzes to explore the transaction value chain of trading, clearing, settlement, and custody. Students and professionals in the financial field will benefit from the book's description of the industry and the details of financial innovation and regulatory response, with their many implications. Finance and business school upper-division undergraduates and graduate students preparing for careers in the financial industry. Finance industry professionals working in financial market operations.